The Norton Museum of Art was founded in 1941 by Ralph Hubbard Norton (1875-1953) and his wife Elizabeth Calhoun Norton (1881-1947). Norton was an industrialist who headed the Acme Steel Company in Chicago. He and his wife began collecting to decorate their home, but then he became interested in art for its own sake and formed a sizable collection of paintings and sculpture. In 1935, Mr. Norton semi-retired, and the couple began to spend more time in the Palm Beaches. 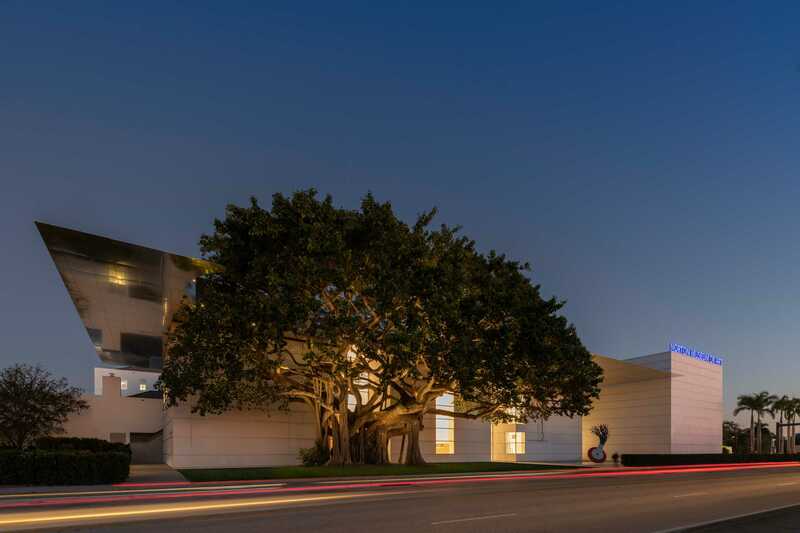 They contemplated what to do with their art collection and eventually decided to found their own museum in West Palm Beach, to give South Florida its first such institution. In 1940, construction began on the Norton Gallery and School of Art located between South Olive Avenue and South Dixie Highway in West Palm Beach. Mr. Norton commissioned Marion Sims Wyeth of the distinguished firm of Wyeth, King & Johnson to design the Museum. The Art Deco building opened to the public on February 8, 1941. Norton continued to add to his collection until his death in 1953, and the works that he and his wife gave the Museum form the core of the institution’s collection today. The Museum’s permanent collection now consists of more than 7,600 works in five curatorial departments: European, American, Chinese, Contemporary and Photography. Since 1954, many distinguished additions have been made thanks to the endowment Mr. Norton created for the purchase of works of art. They include masterpieces such as Stuart Davis's New York Mural (acquired in 1964), and Jackson Pollock's Night Mist (acquired in 1971). In 2011, the Norton launched Recognition of Art by Women (RAW), an annual exhibition series that celebrates the contributions of living female painters and sculptors with solo exhibitions. Funded through the Leonard and Sophie Davis Fund/MLDauray Arts Initiative, the Norton has organized solo exhibitions for British painter Jenny Saville (2011), American painter Sylvia Plimack Mangold (2012), British sculptor Phyllida Barlow (2013), Swedish sculptor Krista Kristalova (2014), African-born, L.A.-based painter Njideka Akunyili Crosby (2016), and Austrian painter Svenja Deininger (2017). RAW 2018 will feature the work of Chicago-born, New York-based artist Nina Chanel Abney. In 2012, the Norton instituted the Rudin Prize for Emerging Photographers, a biennial international award those on the leading edge of the field who have not yet received a solo museum exhibition. Winners have included: Argentine-born, Los Angeles-based artist Analia Sabin (2012); Israeli artist Rami Maymon (2014), and New York-based artist Elizabeth Bick (2016). Prominent art collector and longtime Norton supporter Beth Rudin DeWoody created the Prize to honor her father, the late New York City real estate developer Lewis Rudin. In 2013, seeing the need for more exhibition and education space, with Florida’s population dramatically increasing, Norton Trustees decided to embark on a bold, visionary Museum expansion. The Board enlisted the renowned London-based architectural firm of Foster + Partners to design a new building. Scheduled to re-open on Feb. 9, 2019, the expansion, featuring the Kenneth C. Griffin Building, includes: 12,000 square feet of new gallery space; a doubling of classroom space; a larger student exhibition space; a state-of-the art, 210-seat auditorium; a new store and restaurant; and a Great Hall serving as the Museum’s “living room.” The expansion also includes a great lawn for relaxing or for outdoor programming; a sculpture garden, six renovated 1920s-era cottages to house an artist-in-residence program, and the Museum Director’s home. All to better serve the art and the community.